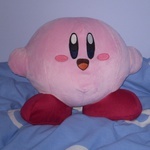 I have a large collection of plush Kirby toys of various sizes. First off, my avatar is one of my many plush Kirby toys. Oh, and I also have a deck of Kirby playing cards I bought in Nintendo New York (I'm from Toronto by the way). I have Kirby's Epic Yarn decals, which I got from Club Nintendo. I have two Planet Robobot sticker sheets, which I got from Ontario Science Centre in Toronto when there was a promotion for Planet Robobot (oh, and I took numerous photographs as well with one of my plush Kirby toys). I have two copies of Kirby's Dream Collection, because I am such a huge Kirby fan. I have two Kirby amiibo (one Smash Bros. version and one on a warp star). I voted 20+ things by the way. I got another Kirby plushie yesterday! There's an excellent selection of plush Kirby toys in Nintendo New York. Plush Kirby toys are found in some Asian toy stores, as well as GameStop, EB Games, CVS, Walgreens, and the Toronto Reference Library. I have quite a few pieces of Kirby merch. Maybe when I'm more motivated, I'll get them out and take pictures. 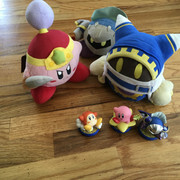 I have a few plushies, 3 different Kirby plushies (one of which is a big 8 inch one I won from a crane game in an arcade with a buddy; enough determination (and money (and alcohol too I guess lol)) can get you anything you want), 3 Meta Knight plushies (one is sitting in my car), 2 Waddle Dees, a King Dedede, and a Magolor is on the way. I have every Kirby amiibo available (including the three Super Smash Bros ones). I bought one of these at Anime Boston last year: kitan.jp/products/putitto_66 I got the Warp Star version. I also have a Kirby Nendoroid and preordered Meta Knight a while back, should be here sometime next month. The Magolor plush can be found via several online toy stores, including Amazon. Just as a warning, it will likely take about two weeks minimum to arrive depending on where you live.